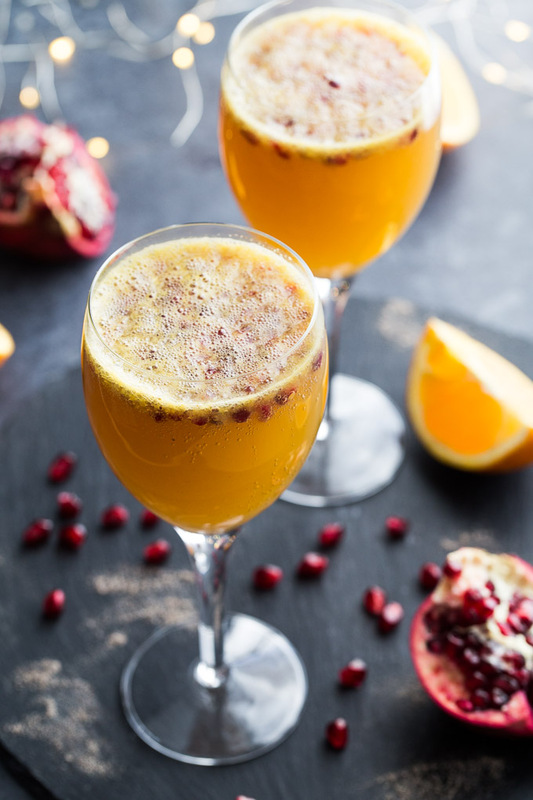 Add some festive flavours to your holiday brunch with these Ginger Beer Mimosas. They’re a spin on traditional mimosas, with freshly squeezed orange juice, vodka, cardamom, ground ginger and ginger beer! 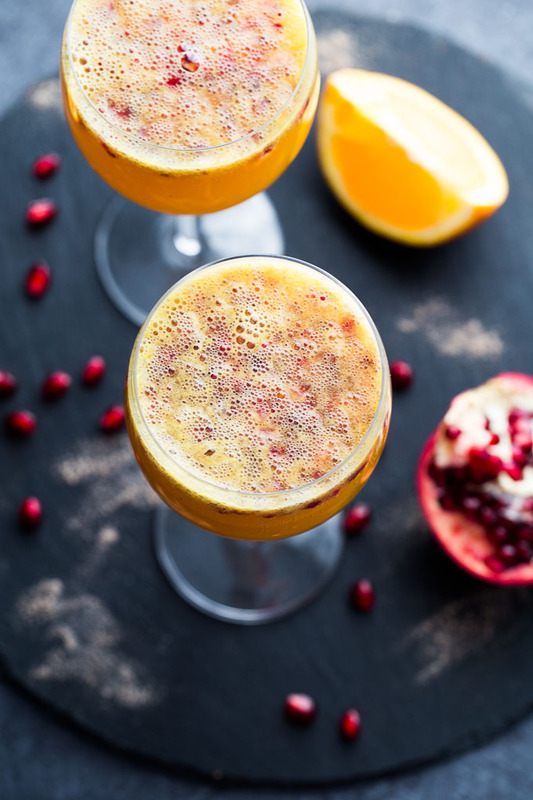 Dropping in today with a quick cocktail recipe for all of your upcoming holiday brunches! We’ll be hosting friends for brunch this holiday season. And to help me narrow down what I’m going to serve, I’ve been working on a recipe round-up of some of my favourite holiday brunch dishes. Keep an eye out for that post over the next few days. 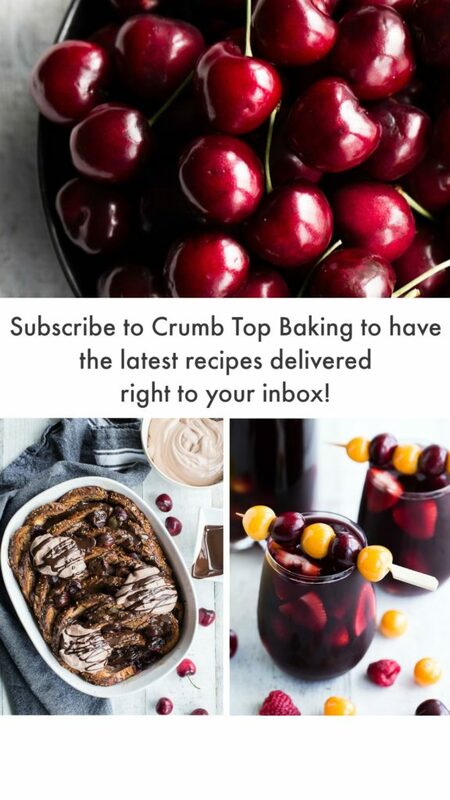 And if you don’t want to miss it, be sure to sign up for the Crumb Top Baking newsletter! Traditional ginger beer originated in England, and was made by fermenting and brewing sugar, ginger and water with a starter culture called the ginger beer plant. It was originally an alcoholic beverage, but today most commercial ginger beers are non-alcoholic. And while ginger beer tastes similar to ginger ale, it’s spicier and less carbonated. If you’re interested it learning more about ginger beer, Thrillist has a great article. I used freshly squeezed orange juice as I always have plenty of oranges on hand. But store-bought orange juice will work too, just try to go with one with no-added sugar. This recipe uses a 330 millilitre bottle of ginger beer, or approximately 11 ounces. You can use alcoholic or non-alcoholic ginger beer. It just depends on how strong you like your mimosas. The recipe calls for vodka, but gin would also work really well. I added a dash of ginger, but you can certainly leave it out if the ginger beer is enough ginger for you! 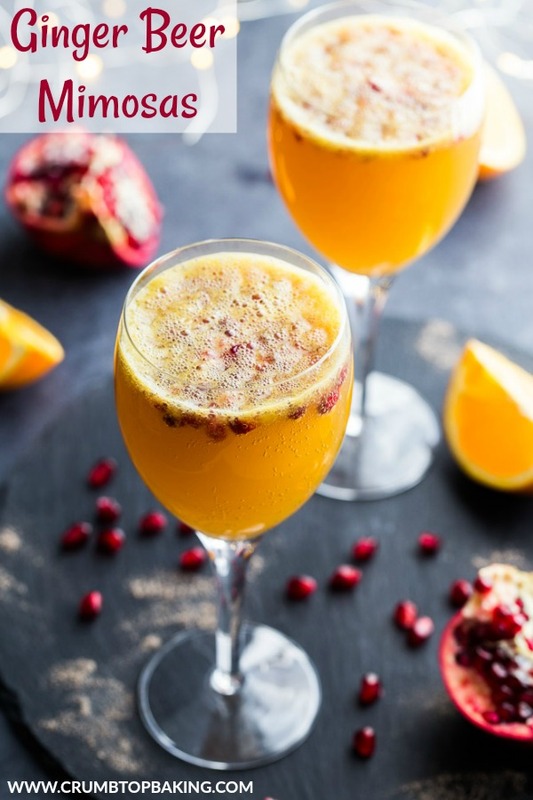 If you make these Ginger Beer Mimosas, I’d love to hear about it in the comments below. Or take a pic and share it on Instagram by tagging @crumbtopbaking. Add the orange juice, vodka, cardamom and ginger to a glass jar with a lid. Shake the mixture until combined. Pour into two champagne flutes or wine glasses, and top off with ginger beer. Add pomegranate arils to garnish. Cheers! You can use alcoholic or non-alcoholic ginger beer, it just depends on how strong you like your mimosas. Store-bought orange juice will work in this recipe too. Just try to use one with no-sugar added. You can leave out the dash of ground ginger if the ginger beer adds enough of a ginger flavour for you. Thanks Dawn! I’m with you and love the little extra ginger. We hosted a holiday brunch yesterday, and these were on the menu! I could enjoy more than my share for sure! Happy almost 2019! These sound amazing, Leanne! I love ginger so these would have the perfect amount of spice for me! I would definitely add extra ginger like you did! I was hoping to pick up some ginger beer this weekend so hopefully I can make these! Awesome recipe! Thanks Haylie! I need to stock up on ginger beer for our holiday brunch. Hope you get a chance to make these. Would love to know what you think if you do! These are beautiful Leanne! I like a subtle hint of ginger, so no extra for me. 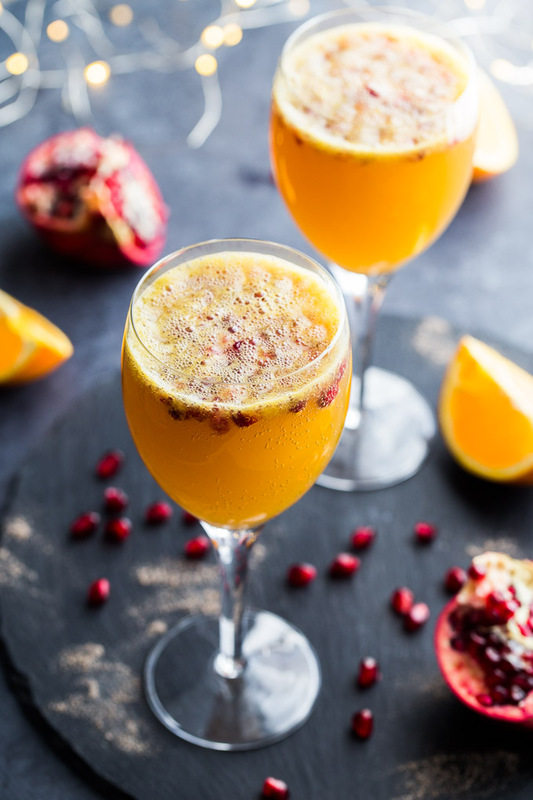 These mimosas sound so herbaceous and refreshing! I’d choose this version over the standard any time. So perfect for holiday brunches! Thank you Marissa! I can wait to serve these to our holiday brunch guests! Leanne, these cocktails look so refreshing and delicious. I really love how easy and quick these are to make as well. So perfect for the festive season. PS: Your pictures of this recipe are absolutely stunning!!! Thank you so much Ashika! Appreciate it! And yes, I’m all about easy cocktails this time of year! We always have a Neew Year’s brunch Leanne and I’m thinking these would be perfect! Cheers to the holidays! Love a good New Years brunch! Hope you get to make these Mary Ann! These sound wonderful, Leanne! In fact, I think I’ll serve them on Christmas morning, since mimosas are a Christmas tradition in my family :). Can’t wait to see your brunch roundup! So perfect for holiday brunches! Let the parties begin! Thanks Annie! Cheers to the holidays! I’ve never had a ginger beer mimosa! It sounds fantastic. I’m a huge fan of ginger beer. I had it in my head once to try to brew some at home, but I just never got around to it. Maybe this will give me the incentive. If you make your own ginger beer I would love to know how it goes! 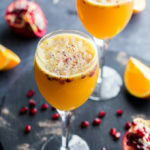 Hope you get a chance to make these mimosas! Thanks for stopping by! Thanks Heather! It’s a great alternative if you’re not a fan of champagne. Hope you get to try it!